Circuit: #390Rectifier Electronic Circuits Designed by David A. Johnson, P.E. 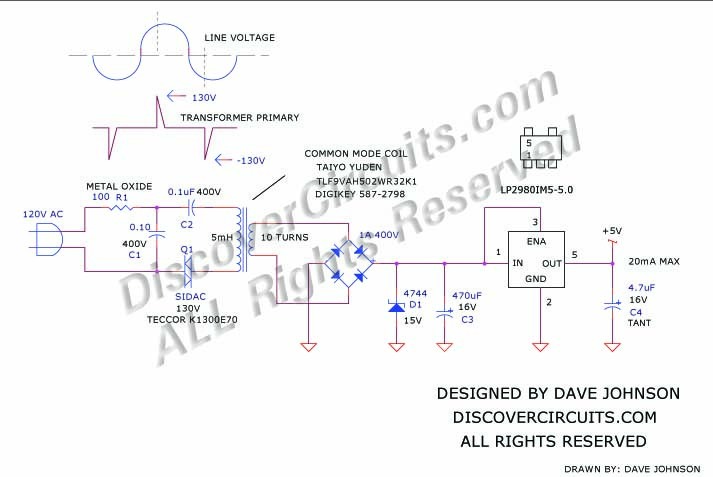 When you need some DC power fully isolated from the AC power line, this circuit may be just the ticket. The circuit uses an inexpensive tiny off-the-shelf 5mH common mode filter coil from with a split bobbin as a high frequency transformer. The circuit routes short 130v pulses to the primary winding of the coil every half cycle of the 60Hz line frequency. It uses a silicon bilateral voltage triggered switch called a “sidac” to discharge a 0.1uF high voltage capacitor. By winding about 10 turns of wire on the secondary of the common mode coil, enough voltage is produced to charge up a 470uF capacitor through a bridge rectifier to activate a 5v regulator. The amount of power produced by discharging the 0.1uF capacitor is enough to provide about 20ma of current from the regulated supply. For many applications, this is sufficient power. If more power is needed, the value of the 0.1uF capacitor could be increased. For 240vac, 50Hz power lines, the value of the 0.1uF capacitor should be decreased to 0.047uF with a 600v rating and a 280v sidac should be used. A “SIDAC” operates much like a two terminal TRIAC. The device has a large negative resistance characteristic. Once the trigger voltage is exceeded, the device switches on and forms a low impedance current path. The current continues to flow until it drops below the device’s holding current, at which the device switches off again. 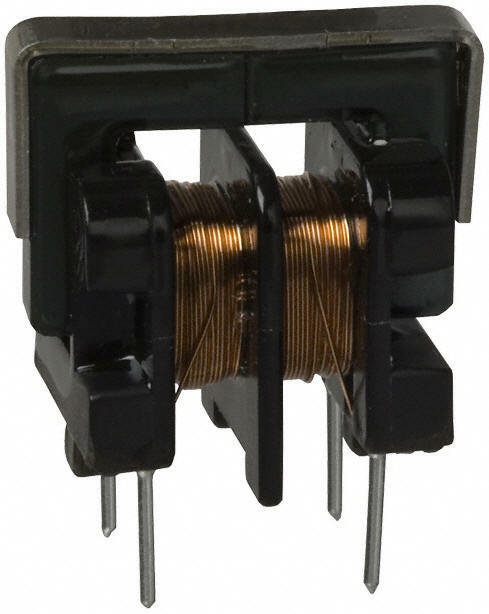 The switch can handle about 20 Amps of peak current, which is perfect for quickly discharging a capacitor. The energy stored in a capacitor is 0.5CV^2, where C is the capacitance in farads and V is the voltage. A 0.1uF capacitor charged up to 130v stores 845 microjoules of energy. Since the capacitor is discharged 120 times per second, the maximum power available from this type of circuit is 100mw. For 240v systems, I would recommend a 280v sidac and a 0.047uF capacitor, rated at 600v. With those changes, the power available will increase to about 200mw.